THE objection hearing on the proposed development in Ukay Heights held at Ampang Jaya Muncipal Council (MPAJ) together with the developer have been declared null and void by residents who were at the hearing yesterday. Taman Hijau Residents’ Association president Datuk Abdul Aziz said MPAJ did not take everyone within the affected boundary into account for the hearing. “We feel that not enough notices were sent out to the residents. Some residents, who had received the letters earlier, were sent retraction letters not to attend the hearing. “We would also like to state that the reports on the proposed development, which we have been asking since March were only given two days ago. We didn’t have enough time to analyse in detail because the reports took time to be photocopied before it was returned.” He urged that another hearing be held after they have studied the relevant documents properly and everyone affected were notified. MPAJ secretary Abd Hamid Hussain said that all the issues brought up by the residents would be taken to the One-Stop Centre (OSC). “The OSC will be making the decisions pertaining to the issues brought up by the residents including the request for another hearing. “We would like to state that no decision has been made regarding the proposed development and everything discussed today will be studied in detail before it’s tabled at the OSC,” he said. The proposed project at Ukay Heights is a mixed development involving 149 bungalows and 460 shop/office units in a 10-storey building. COME Wednesday, the residents of Ukay Heights will be coming forward for a third time to voice out their objections to the Ampang Jaya Muni-cipal Council (MPAJ) over a proposed hill side development in their neighbourhood. While the developers insist that they have followed all the rules and regulations pertaining to the hillside development, residents are still sceptical. Tengku Rozani Putra was busy laying out the placards neatly together. The words in bright red read: MPAJ Please Learn From Your Mistakes were simple enough, but she wonders if they ever would learn. “It’s common sense! It’s so simple, yet why do they not see the truth,’’ she sighed. Tengku Rozani, a long time resident of Ukay Heights said that she was unable to understand why the authorities did not learn from past mistakes. She was helping out with the preparation for the MPAJ up-coming objection hearing on Wednes-day with residents of Ukay Heights at the Taman Hijau apartments recently. Residents from nearby areas had gathered and are busy preparing the placards and notes ready. The first two meetings were deemed null and void due to technical matters and discrepancies between the notice sent to residents and the development proposal that was announced by the Ampang Jaya Municipal Council (MPAJ). The objection hearing is being carried out for a mixed development project involving 149 bungalows and 460 shop lots in a 10-storey building. Like many others, Tengku Roza-ni feels that the project should not have been considered in the first place. She is afraid and no one can blame her after the tragic High-land Tower, Taman Hillview and Zooview incidents that claimed innocent lives. “I paid a deposit to buy a unit in Highland Towers years ago, so did my mother and aunt. And not long after that the tower came down. “I then bought a house in Zoo-view and lived there for nine years, and then the Zooview landslide happened. “Last November I moved into Taman Hijau and now this. It’s frustrating that they (MPAJ) never learn. All it takes is some rain and some soil movements for disaster to happen. I guess we just have to keep fighting and protesting,” she said. 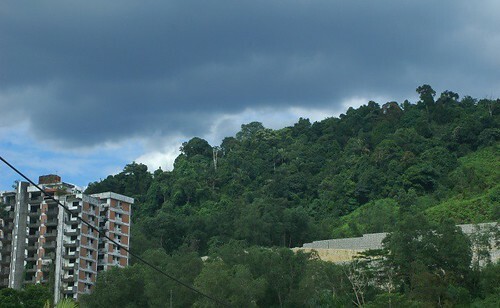 Taman Hijau residents’ association president Datuk Abdul Aziz said the residents were totally against the development, as it did not comply with regulations on hill slope development. “Nothing has changed – the whole project is still contravening guidelines on hill slope development. The layout of the project is the same- despite the changes made, there is still going to be a lot of tree cutting activities and land filling. The original landscape of the area will be gone,” Aziz said. Taman Hijau Apartments Committee Chairman Datuk Mustapha Mahmud said that he was disappointed with MPAJ for not providing residents with a proper avenue to access all the geological, EIA reports and maps pertaining to the proposed project. “We have to go to MPAJ and view the documents at an info kiosk situated in their lobby area. No room is provided to look through the maps and reports for privacy purposes. No copies are provided for inspection, no pictures are allowed to be taken. As layman we need time to look at the reports and this is really strange behaviour from a government department,” Mustapha said. 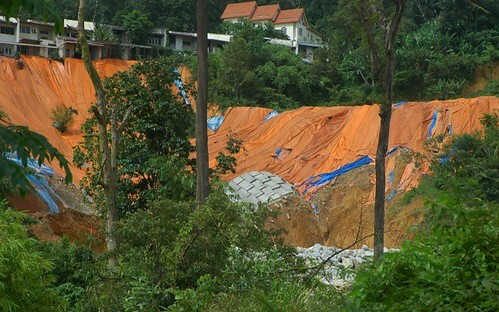 “The greatest fear with any hillside development project is the pressure that might be exerted on the hill slope during heavy rain,” said Aziz, adding that the felling of trees was also going to lead to the weakening of soil and cause massive erosion and even flooding. When contacted, the developer Malaysian Assurance Alliance Bhd (MAA) said that the development was one of the lowest density developments in Malaysia with three units per acre. “We are building along the terrain, there is no heavy cutting, or land filling and it is of low density. We have spent millions on technical reports and went through 13 government agencies scrutinising our proposals and drawings. The proposed development have been scrutinised by the Public Works Department, Ikram, TNB, Syabas, Town Planning De-partment, Health Department, District Land Office and other agencies. The following reports and as-sessment were also carried out: Geotechnical Assessment Report, Independent Geotechnical Audit Report, Traffic Impact Assess- ment Report, Environment Impact Assessment Report, Environmen-tal Management Plan, Geology Terrain Mapping Report, Geology Physical Mapping Report, Soil In-vestigation Report, Soil Erosion Assessment Report and Proposed Development Report. “We have revised the layout plans five times. Everything is as transparent as can be,” he said, adding the development will im-prove the stability of the existing slopes, the infrastructure and overall image of the area. It is so EASY for politicians to show up during tragedies and PROMISE to the people that all will be done to prevent such a future loss of life and property. TODAY is the time when politicians can keep their promises and PREVENT a future TRAGEDY. Indeed, we are all left wondering why MPAJ insists so much on getting this project across?